Crossing Souls is a pixel action-adventure game by Fourattic. The game is set in a California suburb in the midst of a supernatural event that rocks the small community as grand forces siege the town. A group of friends discover a mysterious pink stone that allows to travel between two realms. Control five kids with special skills while fighting and solving puzzles in order to save their families and the world. There are five characters: Chris, Matt, Charlie, Big Joe and Kevin, each one with their own skills and combat styles. Change characters on the fly and use each character’s specialties to overcome any obstacle and target your foe’s weaknesses. Fight in real-time, solve clever puzzles, face off against powerful bosses and play special levels inspired by 80’s arcade video games. 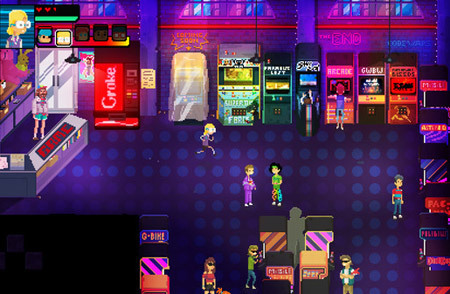 The game features beautiful pixel style graphics and original music that includes tracks inspired by John Williams and Jerry Goldsmith as well as radical Synth-Pop in the purest 80’s style. If you get stuck in the game, check out the video walkthrough and gameplay for the game. This entry was posted in PC Games, PS4 Games, Walkthrough and tagged Crossing Souls Cheats, Crossing Souls Gameplay, Crossing Souls Guide, Crossing Souls Hints, Crossing Souls Review, Crossing Souls Solutions, Crossing Souls Strategy, Crossing Souls Tips, Crossing Souls Walkthrough by Marvin. Bookmark the permalink.